Biological treatment of water makes use of a wide range of micro-organisms and, primarily, of bacteria. These micro-organisms convert the biodegradable organic matter found in wastewater into simple products, such as carbon dioxide and additional biomass. 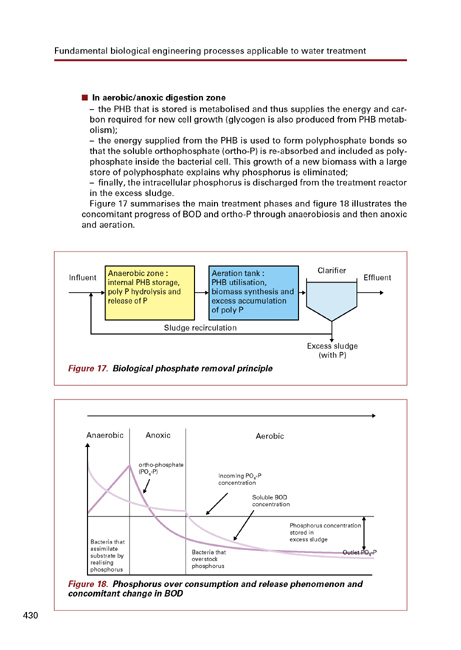 Depending of the environment, biological processes can be divided into aerobic, anaerobic or anoxic degradation processes. These treatments that are the heart of UWW and IWW treatment plants (mainly biodegradable organic pollution), are equally important to the resulting sludge. These treatments also form the basis of many processes used in drinking water processing and which, given their specific nature, can be found in § 6. of this chapter. Descriptions of the relevant technologies can be found in chapter 11 while systems and examples of applications have been grouped together in chapters 22 (drinking water), 23 (UWW) and 25 (IWW).